Hey, guys! I want to know how I sync my video clips from Samsung S4 to iMovie in my iPad. I have an iPad 4 running iOS 7. All the helpful suggestions will be appreciated, thanks in advance. This is common that the Android smartphone users own one or more other iOS devices to have an enjoyment. The two different operating systems bring totally different using experiences, and they also provide different methods for the users to handle the data in their devices. But it’s not so easy as people thought to transfer videos from Android to iPhone or iPad. Taking syncing videos from Samsung Galaxy S6 to iPhone as an example. 1. Start iTunes, and go to “Edit > Preferences > Devices”, and check “Prevent iPods, iPhones and iPads from syncing automatically”. 2. Plug iPhone into computer via USB cable, and iTunes will launch automatically. If not, you need to start it manually. 3. iTunes will display an iPad icon at the upper right corner. 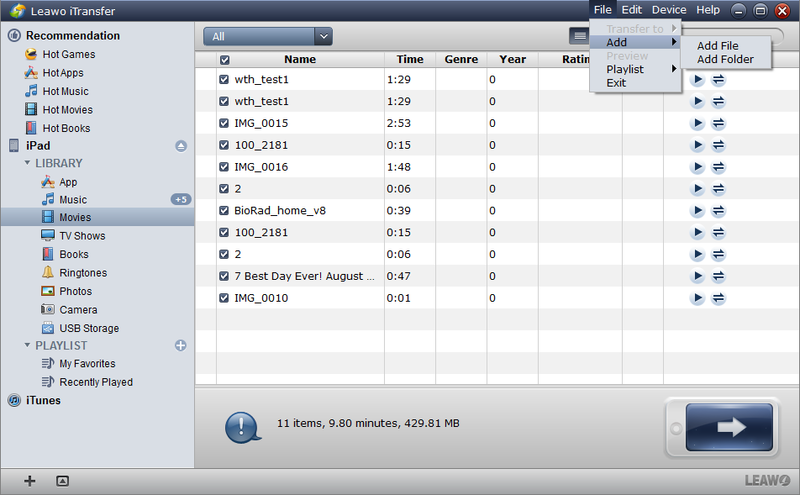 Click “File > Add files to library” at the upper left corner to add the videos from Android to iTunes library. Of course, you need to connect Android to computer as an external hard drive. 4. Click the iPhone icon, and choose “Movies” in the summary panel. Choose “Sync Movies” and select the videos you want. Then click “Apply”. 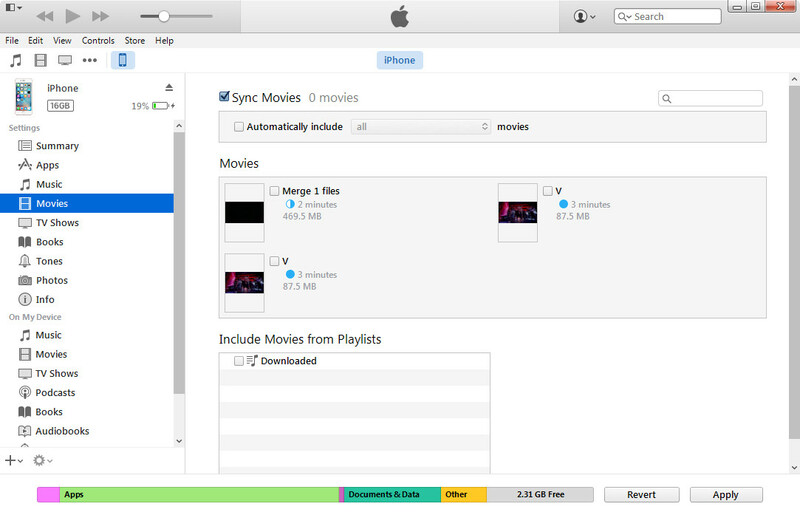 iTunes will sync the videos to your iPhone. Note that the available videos in your i will be replaced by the selected videos. Using iTunes to sync videos from Samsung Galaxy S4 to iPhone can be regarded as the easiest method. Users have other ways to transfer videos from an Android device to iPad. For example, Dropbox is a helpful cross-platform cloud service. Users only need to install the app on both Samsung S4 and iPad, and log in with same account, then they are able to sync move videos between Android and iPad with no efforts. Other cloud services like One Drive, Google Drive and so on can also be helpful on this issue. Users also have a more direct way to transfer videos from Samsung Galaxy S4 to iPad. They can take advantage of a piece of iPad transfer software to finish the task. Among all the transfer programs for iOS devices, Leawo iTransfer is regarded as one of the best. The program enables users to transfer files among iOS devices, iTunes and PCs without the sync of iTunes, and it makes the data transfers of iOS devices easy to be done. The following guidance will show you how to sync videos from Samsung Galaxy S4 to iPad, and you are allowed to free download the software to have a try. Note that the trial version has limited transfer times. 1. Start Leawo iTransfer on your computer, connect both iPhone and Samsung Galaxy S6 to computer with the USB cable. The program will recognize your iPad and automatically the libraries of the iPhone. 2. Copy and paste the videos from S6 to computer. Click “File > Add > Add File/Add Folder” at the upper right corner of the program to add videos from computer. Click “OK” after selecting the videos. 3. Leawo iTransfer will start transferring videos from Samsung Galaxy S6 to iPhone immediately. The software will display the percentage of the video transfer in a progress bar. When the video transfer is finished, you will get the videos in your iPhone. Leawo iTransfer helps users to transfer various kinds of files among iOS devices, iTunes and computer. 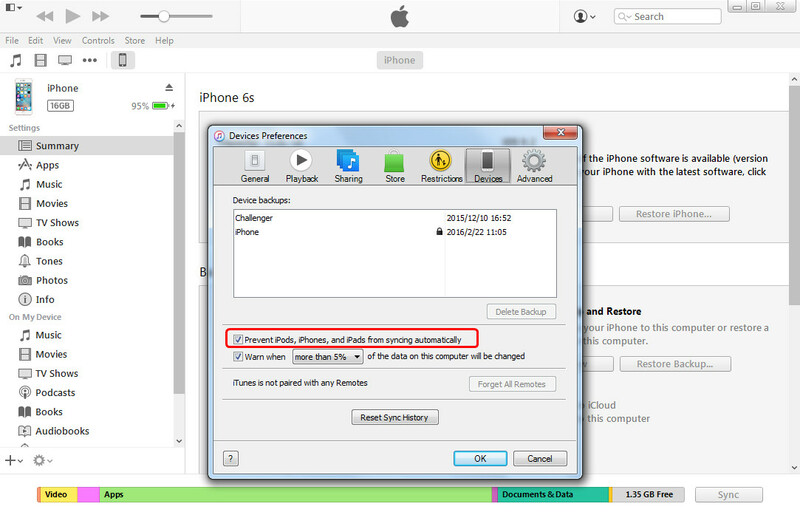 For example, users can transfer apps from iPhone to iPhone with the help of this program. If you are interested in this program, just free download it and have a try. You can also use WhatsApp to transfer videos between phones, like from Android to iOS, iOS to Android, from Android to Android, from iOS to iOS. In this guide, we will show you the quick steps to copy videos from iPhone to Android phone using WhatsApp. Sounds interesting? Follow below steps to easily transfer videos from Android to iPhone. 1. 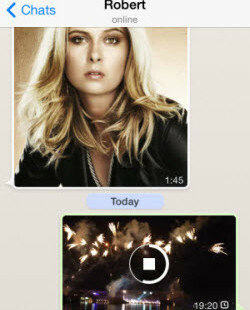 Run WhatsApp on Android phone, open its Chats window, select the contact you want to share your videos on Android phone with. 2. Under the bottom of the screen on your smartphone, you will find a Share or upload icon on the bottom left corner which is in front of the box where you can type a message and send. Once you tap on the share button in WhatsApp, you will bring up a menu and choose the video you want to share. 3. You can take a photo or video and share with your WhatsApp contact, you can also choose an existing video and share with your family or friends through WhatsApp for mobile. After that the selected video will be uploaded to WhatsApp server. See below screenshot. 4. Once the uploading to WhatsApp server completes, the selected WhatsApp contact can download the video from WhatsApp to their mobile phones. The video received through WhatsApp will be saved to the Gallery on your iPhone. Although Email is a bit outdated, it is also a good method to transfer video from Android to iPhone. 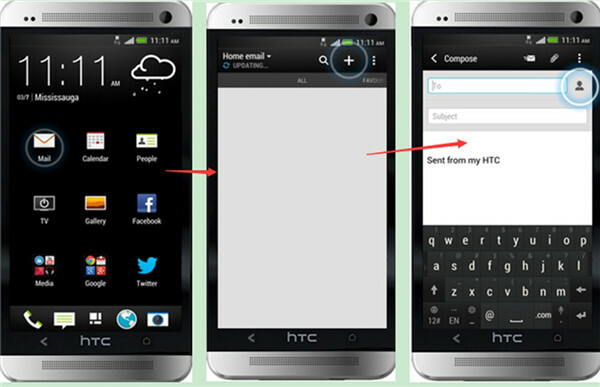 Here I would show you how to use Email to send video from Android to iPhone with the example of HTC to iPhone. The detailed instructions are as follows. 1. On your HTC, click to open the Email app on the home screen. Then you need to click on the “+” icon to compose a new email. In the window of the new email, you need to type in another email address of yourself and other information. 2. Enter a subject in the new email and then enter your message in the area for inputting texts. Afterwards, you need to tap the paperclip icon to select the video you want to transfer. After you add the video file, you can send this new email. 3. On your iPhone, open the newly-sent email and download the video files to your iPhone. This process is quite easy. However, it has limitations on the file sizes. If you have lots of videos needed to be sent, I recommend you not use this solution to solve how to transfer videos from Android to iPhone. 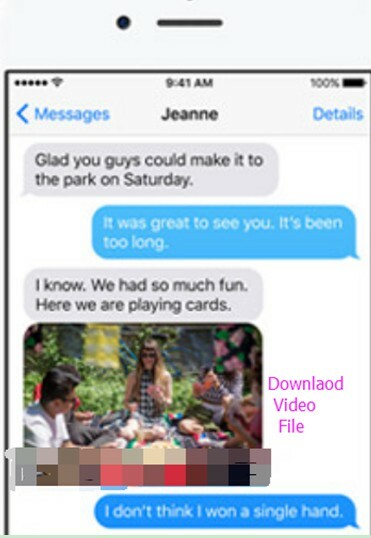 You can use Message app to send video from Android to iPhone. This way is more direct. You just need to create a new message with the video. Afterwards, you can download the video to iPhone via Message. Let’s begin to look at the detailed illustrations on solving how to transfer videos from Android to iPhone with Message. 1. On your Android, launch the Message app on the home screen. Afterwards, you can choose the contact number of your iPhone and click on the paperclip icon to attach the video to the new message. Then tap the send button to send to your iPhone. 2. On your iPhone, you need to open the newly-sent message and then download the video file to your iPhone. 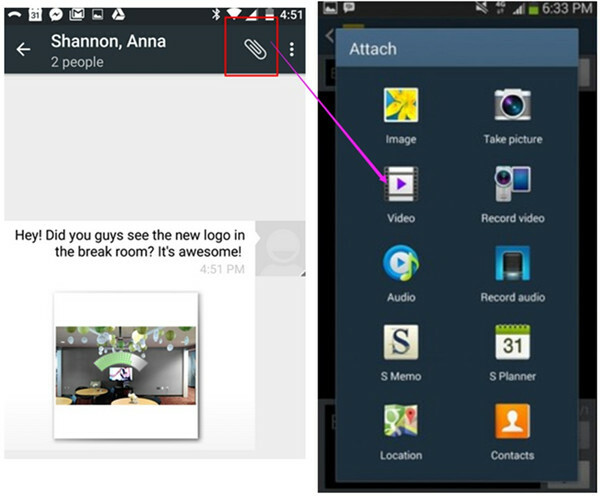 Thus, you can solve how to transfer videos from Android to iPhone easily with the help of Message application. iCloud Drive can be installed on your iPhone and computer. If you want to transfer video from Android to iPhone, you just need to save the Android videos to iCloud Drive on computer and then use the iCloud Drive app on your iPhone to download them to iPhone. This method to realize Android to iPhone video transfer is simple. Continue to read the following contents and you will know the detailed steps to make it. Step 1: First, you need to log into iCloud for Windows with the same Apple account that you are employing on your iPhone to begin to solve how to transfer videos from Android to iPhone. 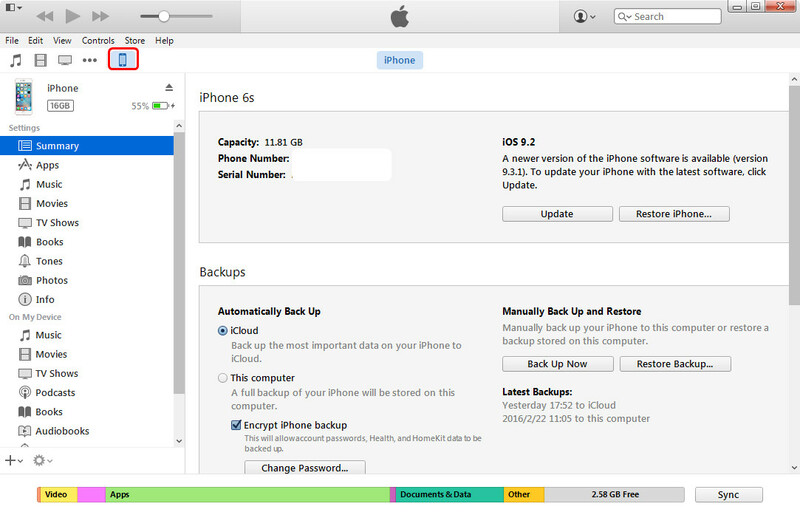 Afterwards, you need to tick “iCloud Drive”. After you have checked other feature as you need, you can tap “Apply”. Step 2: Thereafter, you can access the folder of iCloud Drive in the File Explorer’s Quick Access List. Connect your Android with computer with proper USB cable. Then you need to navigate to your Android storage on the computer to copy the video files you want to transfer to iPhone into the iCloud Drive folder for later use. Note: When you log into iCloud on PC, your iPhone will enquire you whether you want to do so, you need to choose to permit this verification code. Step 3: Pick up your iPhone. On the home screen, you need to tap the iCloud Drive app to run it. Then you will be able to view all the uploaded video files from your Android on computer. Ensure your iPhone has been connected to great Wi-Fi network. Click to open the Android video files and then call out the menu at the bottom of the iCloud Drive interface. Eventually, you can click on the share button to download the Android videos to your iPhone. 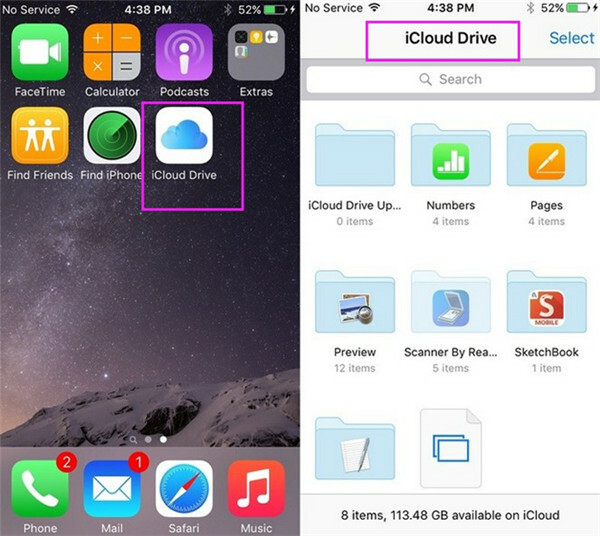 It is convenient for you to use iCloud Drive to help you to send video from Android to iPhone. If you want a more professional Android to iPhone video transfer tool to assist you, you can continue to read the following part in this tutorial.